"Hire a new Mascot car and drive it as your own". 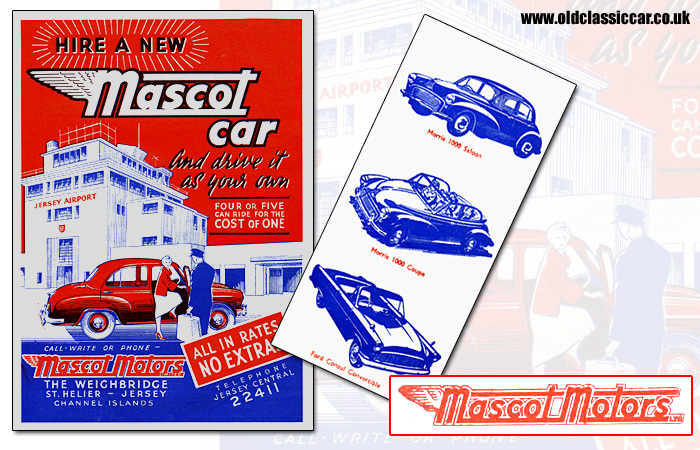 The Mascot Motors leaflet shown here, came with a hotel booking confirmation dated 1963 (the Merton Hotel, Jersey). The cover shows a lady collecting her red Morris Oxford, outside the art deco terminal building at Jersey Airport. Mascot Motors Ltd were located at The Weighbridge, St Helier, Jersey. Potential customers in the 1960s were advised that: "Your NEW Mascot car will meet you at the docks or airport - step right in and off you go - see the places you want to see - whenever you please, free of all worries, for as long as you please". A half-page within the leaflet shows three of the cars on offer, including a Mk2 Consul Convertible and a "Morris 1000 Coupe", or convertible to the rest of us. On the back page are the conditions of hire. A returnable £5 damage deposit had to be paid when collecting the car, and anyone hiring one of the Mascot Motors, had to be aged over 21 and under 66 years of age! There is also a reminder that "the car must NOT be driven on to any beach or sands, to do so is an offence in Jersey .... the hirer shall check and maintain tyre pressures, engine oil and water levels in the car and shall make good any damage caused through neglect of this condition". Two leaflets for the Ryans Self-Drive car hire firm in Ireland, for 1963 and 1964, can be found here, while a tariff card from 1968 issued by Dyne's Self-Drive Cars can also be found in the Collectables section.